I'm all about natural beekeeping. We don't control mites for our bees, we don't feed them sugar water, we don't introduce new queens, and we don't open the hive constantly to check on them. I love it when natural lines up so well with lazy. I thought I'd share our new and improved lazy method of honey extraction from the hive that survives. 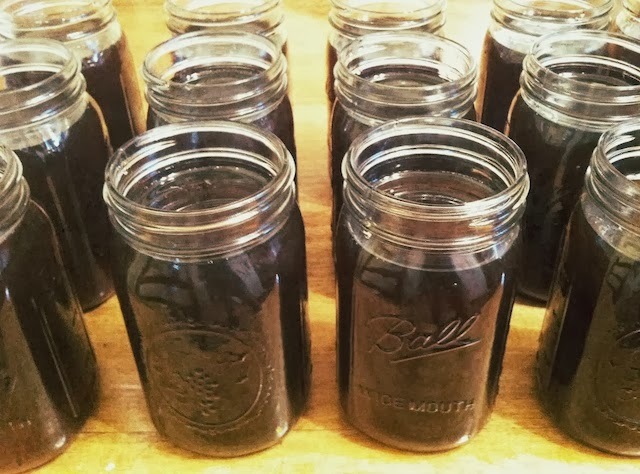 There aren't many photos because, you know, everything is messy; but there are more of the extraction process in a post I wrote last year. Besides, my phone was sticky for a week. 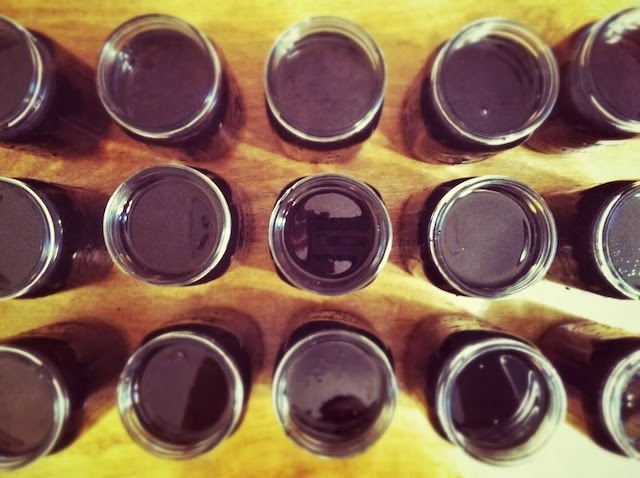 This is a seriously minimal investment for 8-9 gallons of honey a year. One harvest will cover your investment. This year we not only went low budget, we also went low key. I never even donned a bee suit. My husband removed the supers while I was busy the day before, blew them off with the leaf blower to shoo the bees away, and put them inside the sealed rubbermaid tubs in our garage. It is so much easier to separate all of the supers the day before so that you aren't having to put on your gear to get another batch of them while sweating over the extractor. The bees didn't find our operation until the very end of extraction the next day. So we were free to work outside in comfortable clothing the whole time. On extraction day we set up our smaller tub with an upturned cup on the center to balance a frame on, and cut the wax cappings off with a regular, old kitchen knife. We meant to buy a hot knife, but forgot. Last year we used my grandmother's old electric carving knife, but we burnt the motor up on it and it shook so much that it was difficult to use. I expected it to be difficult to use, but it sliced right through with such ease I was surprised. I don't know why anyone would bother buying a hot knife when a normal knife can slice the cappings off with precision and requires no special care. Or maybe I just have the unusual strength of a beekeeping beast. When a frame was de-capped we'd load it into our extractor that was set off of the ground on a couple of milk crates. It holds two frames at once. After taking turns spinning it, we would remove the frames, which were now clean of honey, and set them back in one of the rubbermaid tubs. 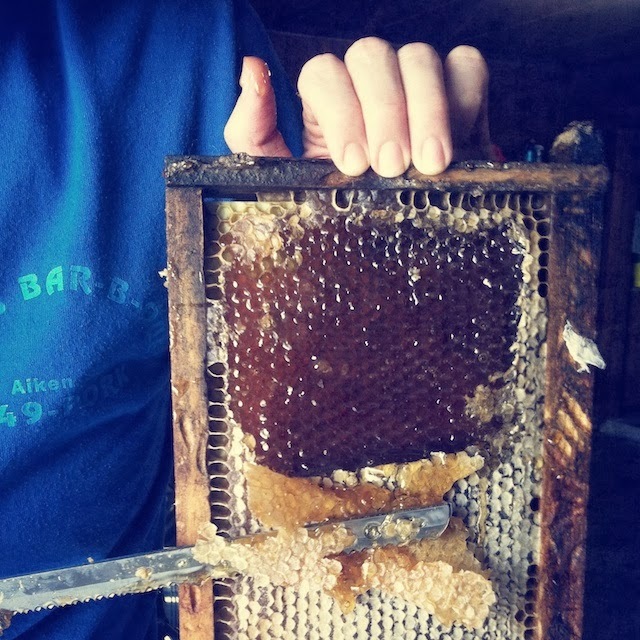 Any comb that stayed on the frames we left for the bees to reuse. 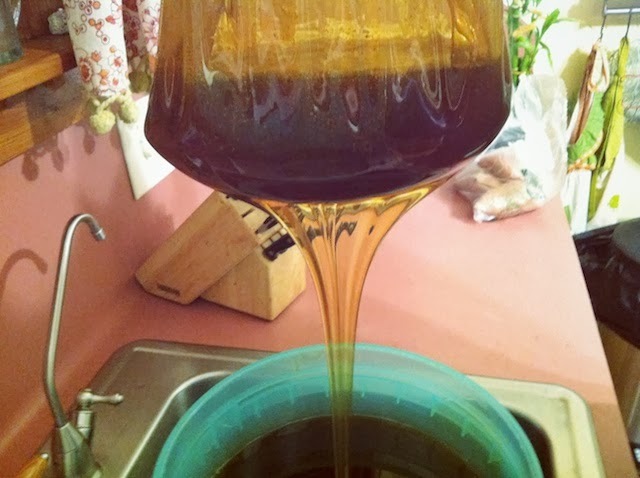 When the extractor was getting too full to turn, we'd put the second bucket under the spigot, placed a kitchen strainer over the bucket, and poured the honey through it. Once the pouring was finished, we put the lid back on the bucket. If you're working outside, you must keep lids on and work quick because the bees want it back. We just repeated this process over and over until all of the honey was extracted. This was two bucketfuls. 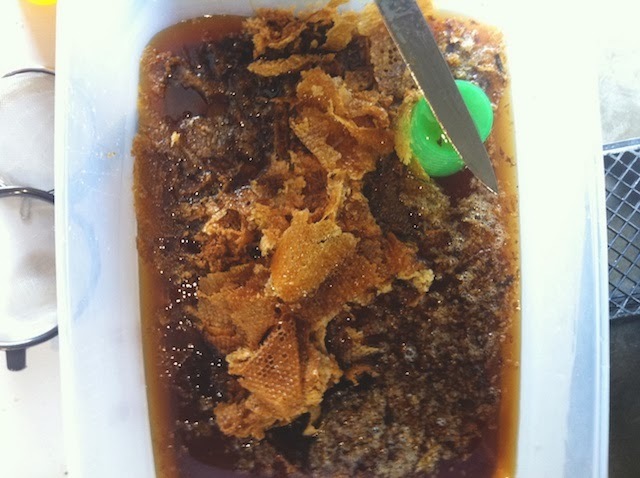 I then scooped up the wax cappings, from the bottom of their tub, and placed them in a large spaghetti strainer set back inside the tub with the lid sealed tight. 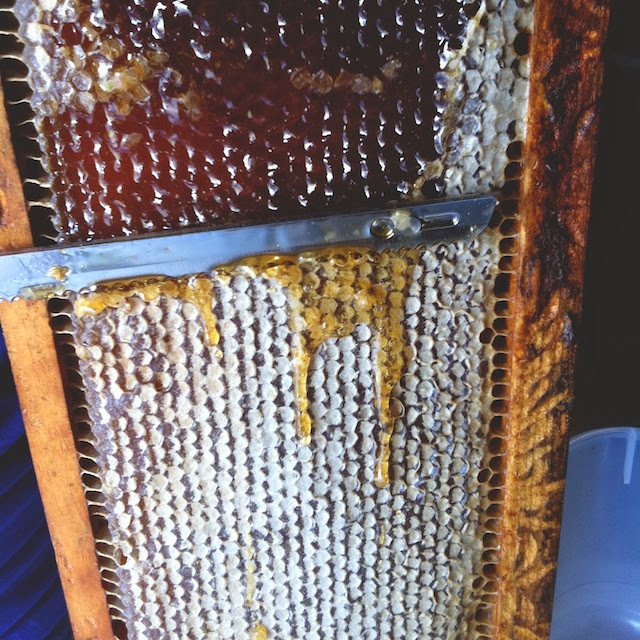 This would strain out any excess honey from the wax and comb. 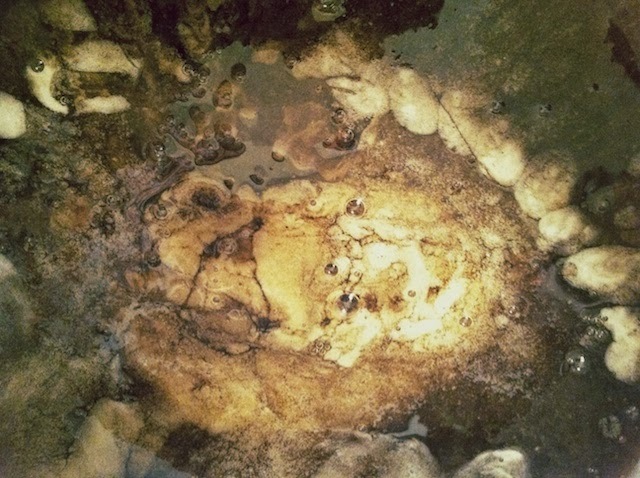 The tub of wax and the buckets were all set on our kitchen counter to rest for a few days so impurities and air could rise to the surface. After a few days, I opened a bucket and used a spoon to glean any air bubbles or collected "stuff" off of the top before straining. There was no visible "stuff" but , you know, you gotta try. 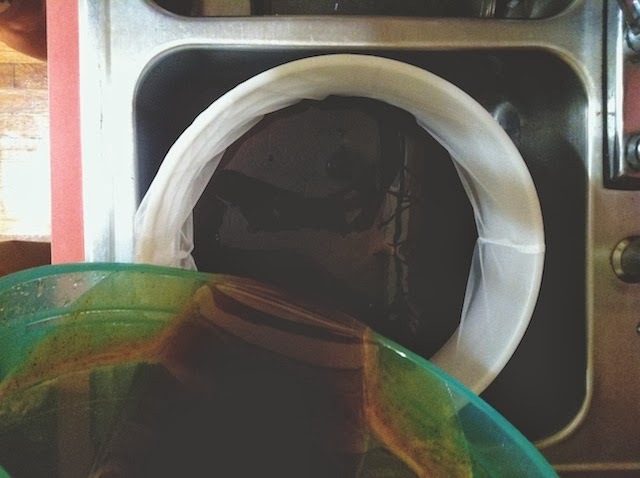 We set the unused bucket into our sink, lined it with a paint strainer and poured honey into it. We gathered the edges of the strainer and lifted slowly, letting the honey drain through while removing any debris from the final batch. No one wants chunky honey. We repeated this with the other bucket of honey and what had collected at the bottom of the wax tub. The honey was then ready to be poured into jars. It's pretty low- maintenance. We'll probably split our hive or get another or something in the next year or so. Eventually, I'll write up a post about rendering the beeswax. But I've got that whole lazy thing going on and I have a vest to make, friends. Michelle, this is AMAZING! I didn't know you had bees! I love seeing the process and how you can keep it so low-key. My husband is obsessed with honey. We go through a lot around here. 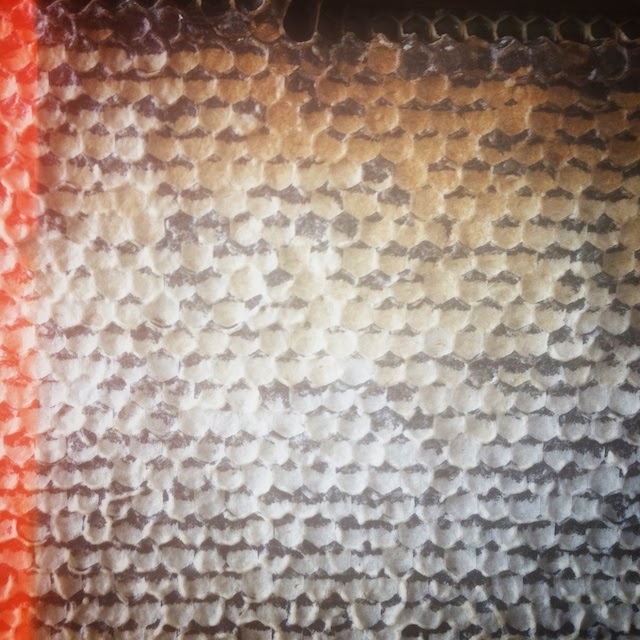 What do you make with the beeswax? I used to make homemade chapstick with it and I swear it's the best. I just reread and edited this thing. It was full of typos because I was rushing to go somewhere. But, yes, beekeeping can be low key. One hive is perfect for one family. We are going through the honey quickly, but still could sell some if we want. If we get another hive going, we'll have all of that to sell. It's not so much about making money as it is about providing something good for the community (bees and raw honey) while charging enough to recover our costs. I haven't made anything with the beeswax yet, but I was thinking of chapstick too. Since I only have one hive, it's a good amount of wax for something like that. I have a friend who makes it and it is as good as Burt's Bees. 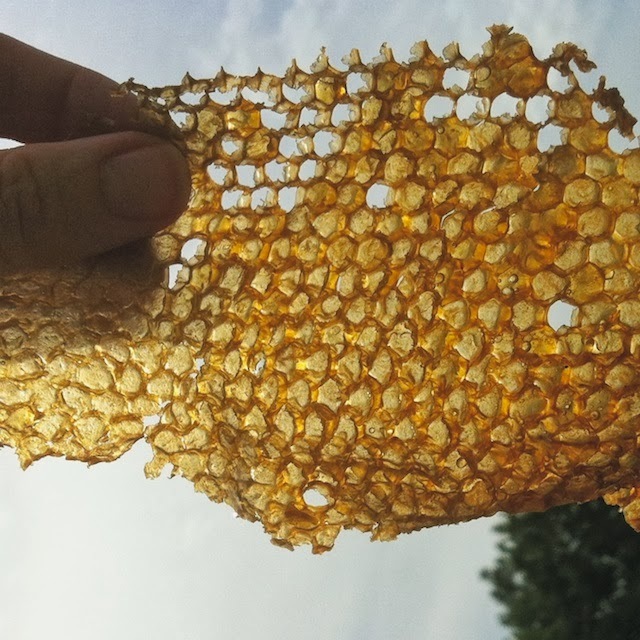 She adds propolis from the hive for the added health benefits. That honey looks delicious. I wish I could taste it! mmmmh. For us it's impossible to do something like that, living in a city and a small apartment, but I enjoy a lot your photos about it. BTW, I'm hosting a give away for my birthday. The prize is a pattern of your choice from Ravelry. You just have to leave a comment on my last post. I've heard that some people keep hives on their apartment balconies, but I'd think most neighbors wouldn't like it. I saw that on your blog, Elena, and wanted to wish you happy birthday but felt kind of bad about entering another giveaway. I've recently won a few knitting related prizes, so I thought I'd just message you on Ravelry. I guess that's kind of silly, so I'm headed over there now. That would be a great post idea, Vanessa. I don't actually eat a lot of sweet food, but I take it in my tea or coffee and use it on my skin. I think a spoon a day is good for us. Now, my husband loves It on biscuits. Well, we have two balconies, but they have just the size to hang our clothes to dry or just put a couple of chairs. Not enough space for bees. It's the prize you have to pay to live in the center of a big city. The good part is that this area is quiet, small streets and very few cars. It's great for the skin! I used to use it on my face every night, but I've fallen out of the habit.